The misuse of prescription stimulants among college students has been an increasing problem over the past several years. Rates of such misuse range from 5 percent to 35 percent nationwide, with higher rates occurring at colleges in the Northeast, according to research conducted by University of Rhode Island Psychology Professor, Lisa Weyandt. Weyandt noted that Adderall is the most commonly used and misused prescription stimulant in the United States. 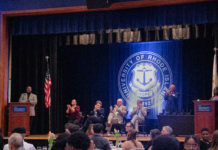 Weyandt, who is nationally recognized for her research on stimulant use and misuse, conducted a study at URI in 2009 with students who did not have ADHD or other disabilities. She and her colleagues found that 7 percent of the participating students reported misusing the drug within the past 30 days, 9 percent within the past year and 20 percent in their lifetime. According to various studies, there is increased Adderall use among students during midterms and final exams as compared to the first week of classes. The highest rates of misuse occur between the ages of 18-25. In a review study conducted at URI, Weyandt and colleagues found that nearly 18 percent of graduate students, 12 percent of dental hygiene students, 11 percent of Pharm. D. students and 10 percent of medical school students reported misusing prescription stimulants. Weyandt also found that misuse tends to be higher among students who are male, who are members of greek life and who have a low GPA. Additionally, those who are under greater psychological distress (anxiety, depression, stress, etc.) are more likely to misuse. “What’s interesting is that… the main reason students report taking [Adderall] is…to enhance their academic performance but yet those students are the ones who tend to have the lower GPAs,” said Weyandt. Why is this so? One theory suggests that some students are self-medicating and fall into a negative cycle. The use of Adderall can lead to sleep deprivation, which impairs concentration and can interfere with one’s academic performance. Students keep taking it despite these side effects because they need it physiologically in order to focus. And the cycle continues. There are several predictors of misuse, including procrastination, poor time-management and use of other substances. Most students report using prescription stimulants for neurocognitive enhancement- to focus and to improve concentration and academic performance. Some students report using them “out of curiosity” or because they perceive that their peers are using them as well. According to Weyandt, 25 percent of graduate students have been offered prescription stimulants and 61 percent of undergraduate students have been by the time they reach their senior year. Weyandt said that students seem to prefer taking the short-acting Adderall because it wears off within five hours, so they can conveniently take it, say, if they have two exams on a particular day. Over-focusing is an issue faced by college students who take too high of a dose. They might get stuck on a paragraph they are reading for class or they might even develop some compulsive tendencies that result from becoming distracted but simultaneously being focused. There are mixed findings in research about whether stimulants are in fact neurocognitive enhancers. Some studies have found no effect on cognitive processes in “healthy adults” while some other studies have found improvement in memory and executive functioning. However, no research has focused on reading comprehension or quality of academic work. Where are students obtaining these stimulants from if they do not have a prescription? Mostly from each other. Weyandt and her research team have found that 15 percent of graduate students and 50 percent of undergraduate students from across the United States reported that they were easy to get on college campuses. Health Services conducted an as-of-yet unpublished study with the Pharmacy Department which found that very few students keep their medications in secure locations. 27 percent of students report having witnessed people sharing medications (all types, not just stimulants) and 24 percent report having personally shared them or gotten them from friends. There are ethical issues that come along with this topic. Colleges and universities are now questioning whether misuse of prescription stimulants constitutes academic dishonesty and some have even included it in their ethical codes of conduct as cheating. Procopio notes the difficulty in drawing the line between disorder and mere enhancement. According to one study, students are more accepting of stimulant misuse for academic enhancement purposes while they condemn steroids for athletic enhancement. Weyandt and her colleagues found that both graduate and undergraduate students tend to regard misuse of prescription stimulants as “harmless.” But the use of these stimulants is actually more harmful than some think. They can have cardiovascular side effects and can induce mental confusion, psychosis and even sudden death. Emergency room visits related to misuse of prescription stimulants for adults 18 to 25 increased from 5,000 to 15,000 from 2005-2010; 45 percent of these visits involved these stimulants plus alcohol or other illicit substances. There is also concern about students being uninformed about the doses they are taking by using what their friends recommend. Moreover, students are not just ingesting these stimulants orally, they are doing so rectally in addition to snorting, injecting and smoking them. Weyandt says that we do not yet know exactly what could decrease prescription stimulant use among college students. Psychiatric Clinical Nurse Specialist at Health Services Kathleen Doyle said she encourages students to utilize the Fascitelli Fitness and Wellness Center for things like yoga and meditation and talks to them about the benefits of exercise. She also refers students to the Academic Enhancement Center, where students can learn how to study in more efficient ways. In addition, there is a Health Education Department at Health Services which offers a program on mindfulness and time management. “If [these students] can learn how to manage their time, it reduces a lot of that angst,” said Doyle. “There are many things that people can try to do and time management [that are] far preferable to putting a foreign substance in your body if you don’t need to,” Procoprio said.